Inder Loves Folk Art: Garden Tour: Mid-May 2012. Well, I finished sewing my ring-sling, but I am really unhappy with the results. This was supposed to be an easy project, but due to a combination of factors - the thickness of the linen I used, the topstitching thread I chose, the style of pleat I finally selected, and the limitations of my sewing machine - the pleated shoulder looks like a hot mess. I ripped it out and redid the whole area several times, and it still looks like total crap. So I wadded it up and shoved it in a corner for now. I'll take it out and consider my options at a future time. Ugh. Whatever. You win some and you lose some. It's a little embarrassing that such a simple project (billed as easily do-able even for folks who have little to no experience sewing!) totally derailed me, but so it goes. Right! So let's talk about the garden, shall we? After a lot of rain in April, May has been warm and beautiful here in the San Francisco Bay Area. Aaahhh. Sunshine. It has been glorious, I tell you. 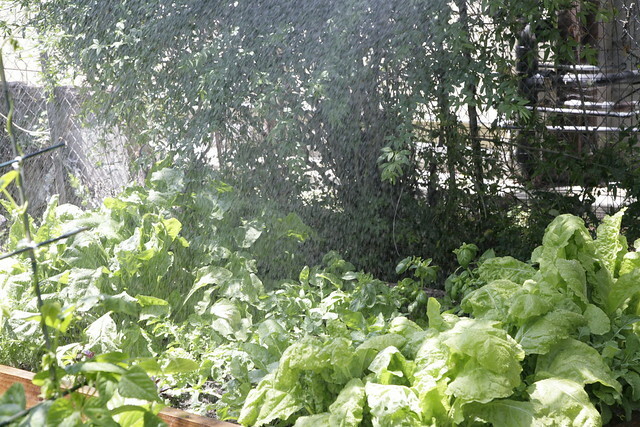 Our raised beds are now overflowing with vegetables! 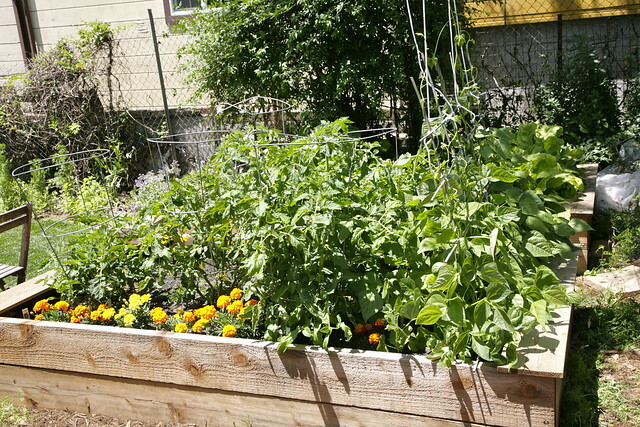 This is our tomato bed, with beans at the right end (and some marigolds for color and companion-planting purposes). I've staggered the tomato planting, so the tomatoes (all heirlooms this year) are different sizes right now, but I expect that will even out by later in the summer. I built very simple trellis for the runner beans (some of which I'm growing from seeds collected from last year's bean crop! ), and then Steve extended it with clothesline up into the branches of the Gingko tree above. Now the beans have a whole lot of room to grow! 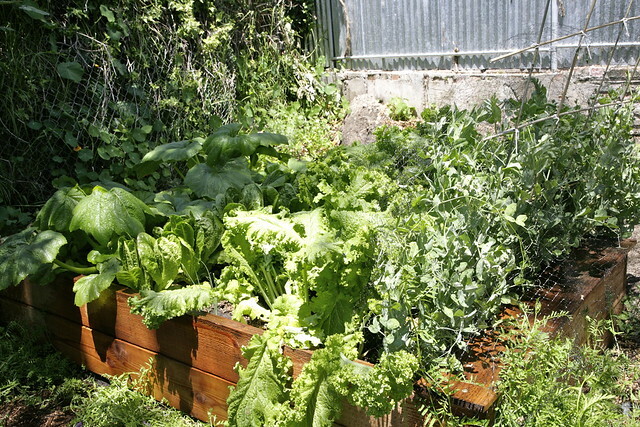 The bed to the right is in partial shade, which has proven to be the perfect environment for a messy and haphazard mix of chard, arugula, beets, and carrots. There are also some basil plants in there, although I don't think they're thriving in the shade like the other plants are. Here's a shot of it drinking in a shower of water from the hose. The back bed gets morning sun and partial afternoon shade - it's exploding with lettuce, summer squash, mustard greens, and peas. Truth be told, I seriously need to harvest the beets (and beet greens), mustard, and at least some of the lettuce to give the other crops some more space, but eating all of that food is an overwhelming prospect! We've already eaten quite a lot of mustard greens this year, much to the delight of my midwife (my iron levels are great this pregnancy! ), and the household is starting to tire of dark leafy greens (translation: I am the only one who will eat them at this point). So I'm desperate for some new recipes calling for greens, because even I'm getting a bit tired of them. Either that, or someone needs to come over and take some of these greens away! I've also been eating salad frequently, which has actually been perfect for all of his hot weather, but I need to eat even more! It turns out the secret to getting Steve to eat salad is to let him grill some steak to throw in it. I haven't figured out the secret to getting Joe to eat salad (or really, anything green yet), but I keep putting it in front of him hoping to convert him one of these days! 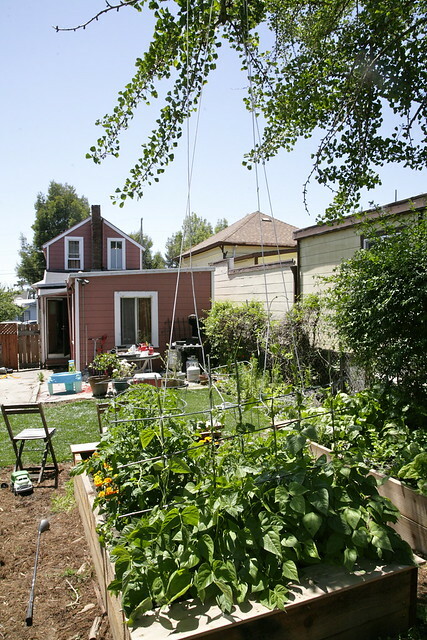 The San Francisco Bay Area may not be the ideal climate for tomatoes, peppers, eggplant, and watermelon, but boy, oh boy can we grow greens. Lordy. 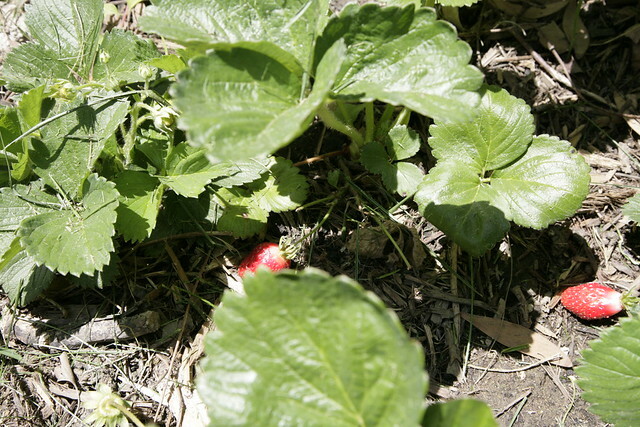 Some other random sightings in the garden include a dozen strawberry plants that I planted earlier in the spring. Joe may be skeptical of green leafy vegetables, but he loves berries. So he and I have been enjoying eating a strawberry or two most days this past few weeks. There's nothing quite like eating a strawberry straight from the garden, warm from the sun. Next year I am planning to double the size of the strawberry patch, because, uh, yummy. The grape vine (a purple seedless table grape) I planted two months ago is looking lovely. 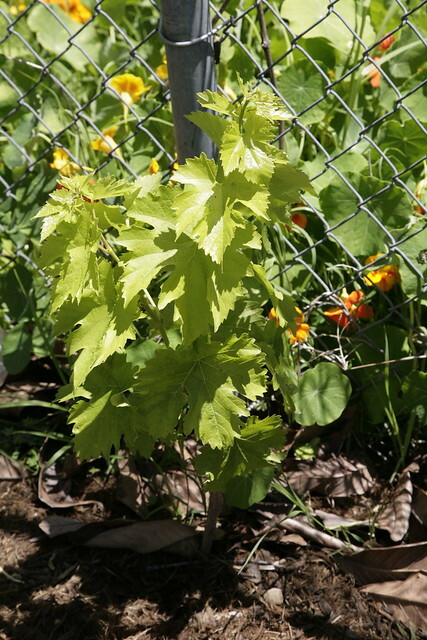 I can't wait for it to grow up on that fence, and best of all, start giving us some grapes! 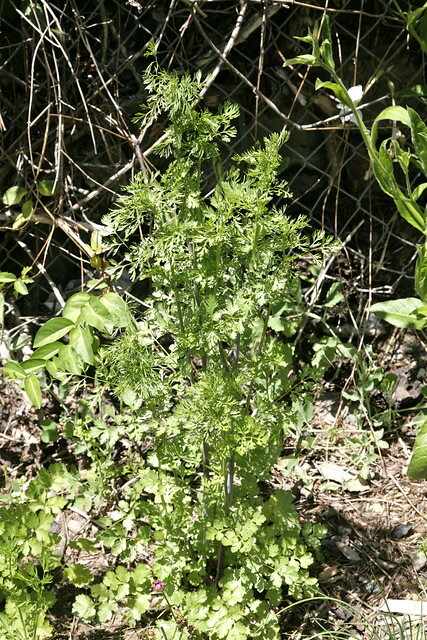 It's only May, and my cilantro is already bolting. Does anyone else have this problem? My cilantro bolts less than four weeks after I plant it, every single time. Is it because it's been too warm? I don't want coriander, I want cilantro! Tips, please! 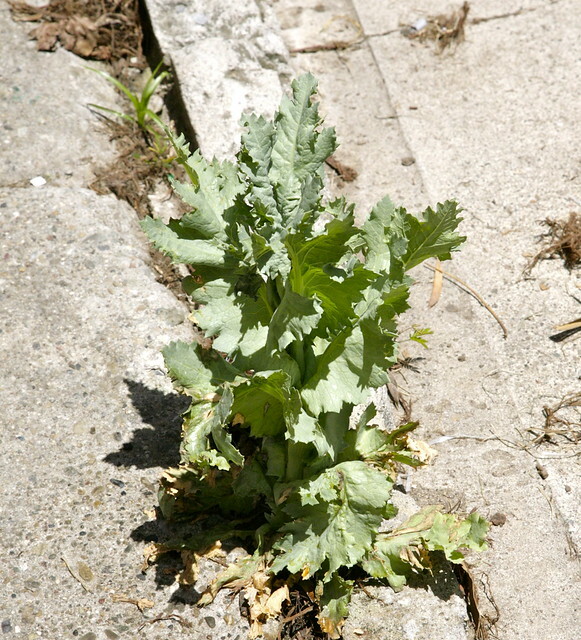 Steve is delighted that this little poppy volunteer is growing between the cracks in our cement patio. Stubborn little plant! We've been sneaking a little water to it here and there. I can't believe it has survived the dogs and foot traffic so far. This lemon balm, which is part of my hummingbird/butterfly/bee attracting bed (still in the works), is thriving and threatening to take over the whole bed, making me wonder if I will live to regret planting such an invasive mint-relative right into a bed! I better start making some tea! 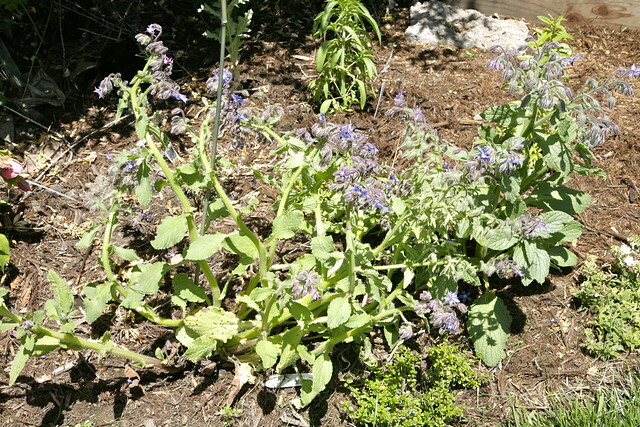 The borage is going crazy in the same pollinator-loving bed, and sure enough, the bees love it! Borage self-sows and can be a little invasive too, but when you're looking at a brand-new, bare garden, more greenery seems like a good thing. 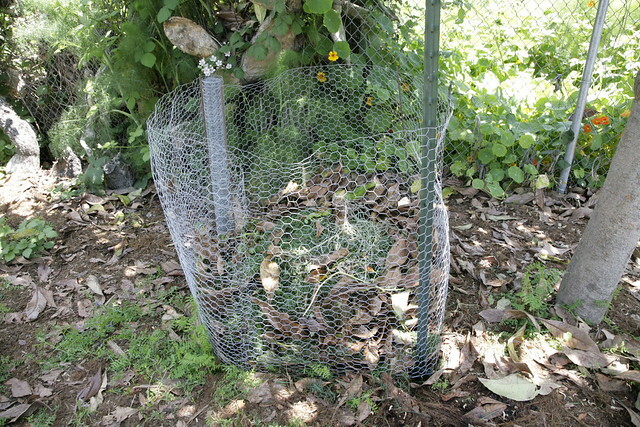 We even set up a very small, modest composting area. I have more ambitious plans for the future, but this will do for now. And last but certainly not least, here is a random sighting of Joe, who is currently working on potty training. This translates into a lot of time with nothing on his lower half but Thomas undies. I can't say Joe has figured out the whole potty thing yet (or even started to figure it out), but at least he's willing to run around in his undies here and there, which is an improvement on a month ago. Joe understands that the adults in the house wear undies and use the potty, but when I ask him when he'll start using the potty, he says "Soon." In Joe-speak, much like politician-speak, "soon" translates to "maybe one day" or "on my own sweet time, thank you very much," or, in extreme cases, "forget about it, mom, it'll never happen." But at least he's thinking about potty-training, right? Baby steps. Meanwhile, I can't stand how cute he looks in his big-boy underwear! This has been the first year that Joe has really participated in the garden. In prior years, he enjoyed hanging out with us while we worked, but his role was more destructive than helpful. This year, Joe is grasping the concept of gardening. When I get home from work in the evening, he runs out back with me to "look at the baby plants!" Never mind that most of the "baby plants" are all grown up now - Joe now understands that we are trying to grow the baby plants, and that they need water and attention. Joe loves to help water the plants, dead-head flowers (although he's not always the best at distinguishing spent flowers from new buds, it's not for lack of trying), and harvest vegetables (we run into similar issues with harvesting as dead-heading, but he's catching on!). And of course, he loves to play in the hose, push his toy diggers around, and get dirty. If there is anything at all to astrology (which remains to be seen), Joe, my little earth-sign Taurus, will be a gardener. Sad to say, this idyll of sun and warm weather is likely to end quite soon, when inland California heats up, sucking air from the Pacific Ocean over the coastal regions, resulting in the advection fog that the City of San Francisco is so famous for (I bet you didn't know it's "advection fog"? oh, you did? hi Bay Area friends and coastal dwellers from around the world!). While Oakland is warmer than San Francisco (one reason I live in Oakland! ), June and July in the East Bay are often characterized by never-ending overcast and chilly breezes. We can but enjoy the sunshine while it lasts. And there is always September (our other warm month) to look forward to. Holy moly, you must have more sun than we do in Seattle. ;) I'm totally impressed. We've got some greens that overwintered and I've put some starts and seeds out, but our beds are definitely not that lush yet. I'm waiting till next month to set out the tomatoes. Well, we don't have to worry about frost the way y'all do up there (we get a light frost, uh, every couple years or so, and real freezes pretty much never), so that makes a huge difference in how "advanced" the garden looks. My mom, who lives in Bellingham, won't put tomatoes out until after Mother's day (or is it Memorial day?). But yes, May hasn't just been sunny - it's been downright HOT. It's awesome for me, because I am so sick of wearing maternity pants I can't even tell you - I just want to go bare-legged! But of course, if it lasted too long, my ankles would start swelling and then you'd hear me complaining about that instead! No tomatoes yet - until recently I was actually picking the flowers off the plants, to encourage them to get more green growth before they focus on fruit (I'm still doing that with the smaller ones). I like to see the plant nice and lush before I allow any flowers to set. So now I'm letting the bigger plants flower, but honestly, no matter what I do, I rarely get tomatoes before August at the very very earliest, due to all of that summer fog, so I'm not stressing. Your season there in Texas seems pretty different than ours - everything gets going earlier, but also, tends to peak earlier, no? My friend Emilly got me into your blog, and I've been (mostly) silently reading for quite a while now...time to de-lurk! I just bought a sun-calculator, and I'm hoping it doesn't bring bad news...I'm not sure what we'll do if we find out our "I thought it was sunny" corner isn't sunny for long enough periods of time to benefit the new plants. Your first real vegetable garden!! How exciting! In my experience, something will generally die on you, and something you didn't expect will generally thrive and go crazy - that's just the way of things. So don't think that means you have a "black thumb." I don't believe in "green thumbs" anyway - gardening is not a natural ability, it's a skill that you learn like any other skill. For most of us, that's a process of trial and error, and there's a lot of error! That said, being the kind of person who "naturally" remembers to water your garden is a big help if you live in a dry climate! Are you in Oakland? I grow a lot of veggies in partial shade here. Most greens, cucumbers, squash, beans, and peas will do fine with just morning or afternoon sun, but not both, in my experience. Tomatoes and peppers generally want more sun than the San Francisco Bay Area can offer even in the hottest exposure (we have too much fog and cloud cover), so they do not do as well in even partial shade. I try to reserve my hottest, sunniest spot for the tomatoes. I have harvested some cherry tomatoes in partial shade, though. Cherry tomatoes require less heat than big beefsteaks. And all of our tomatoes are of the Cherry variety, so hopefully this is good news!! Thanks for the encouragement! Looking great! It has come a long way from getting it all dug up! And big tomato plants and red strawberries! Mmmmm. 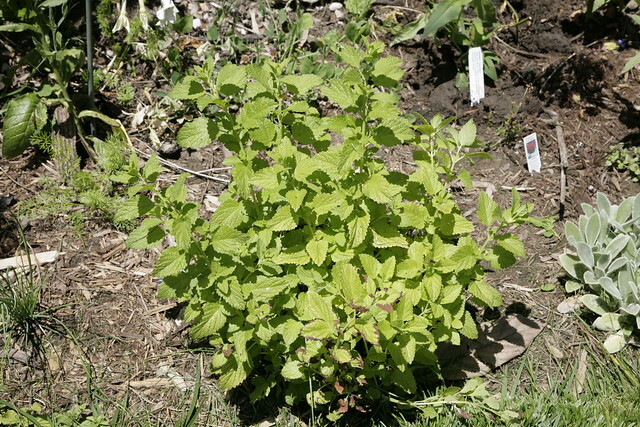 I haven't planted lemonbalm, but I should. Love it! Ah, he'll eat greens eventually. My kiddo is just weird for a kid and loves all that earthy and strong stuff. She adores lovage...and I find it vile. Way too intense. Thanks Meg!! I do feel we've come a loooooong ways this year! From pretty much nothing to hey, the bones of a garden! I can't wait for my butterfly bush, grapes, raspberries, and other fun stuff to mature a bit and start to fill in the gaps. But it's happening. I'm excited about it. And in the meantime, my goodness, apparently I can grow some serious green-age! Does your kid like mustard greens? Talk about strong, earthy flavor! Joe says "too 'picey!" and I have to say, they are a bit pungent! I love the bean trellis reaching for the sky... maybe there's a giant's castle up there in the clouds? 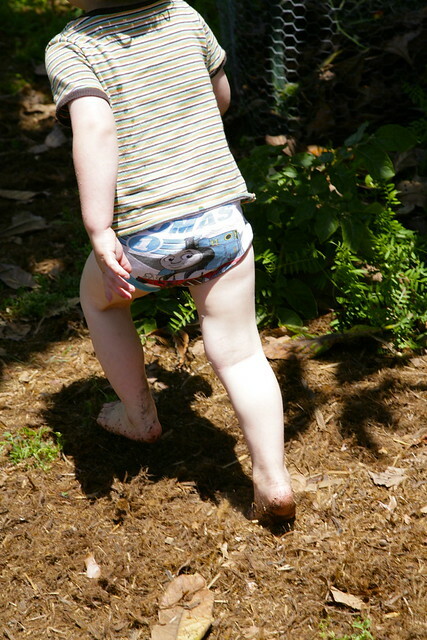 Summer is the perfect time to have a go at potty training. Good luck! It's a strange thing, I think it's very individual with each kid. Even after three I don't think I have any useful advice to give. Except maybe bribery, ha! from what i've heard, cilantro bolts when the roots hit a certain temperature. ours is done for already ;( not sure there's much you can do. but if you find something, let me know! !